A couple months ago Julep announced that they were working on an innovation that would change the way we paint our nails - the Julep Plié Wand. I love that the name was inspired by the graceful moves and lines in ballet - very appropriate for this tool, since it moves so smoothly from one position to the next. 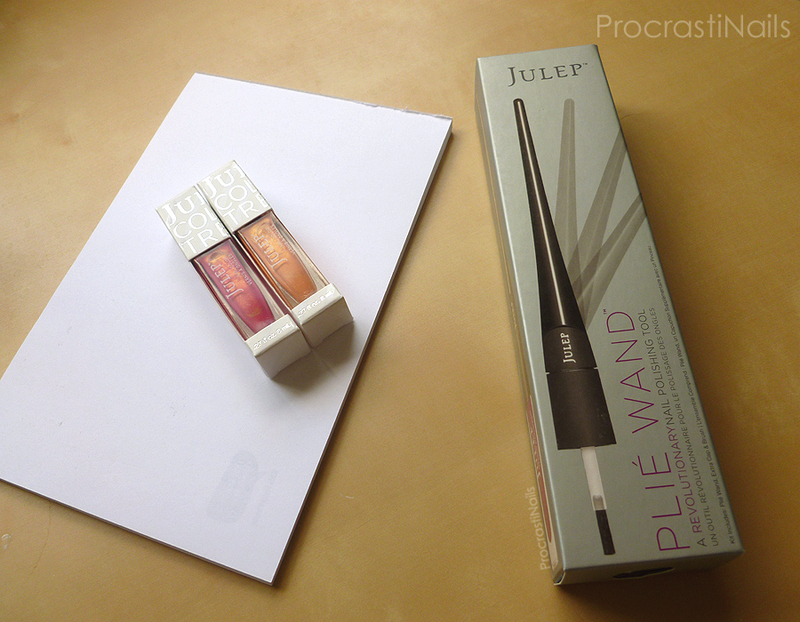 Julep crowd funded the money to develop the product and they were released with the May 2014 Julep Maven boxes. 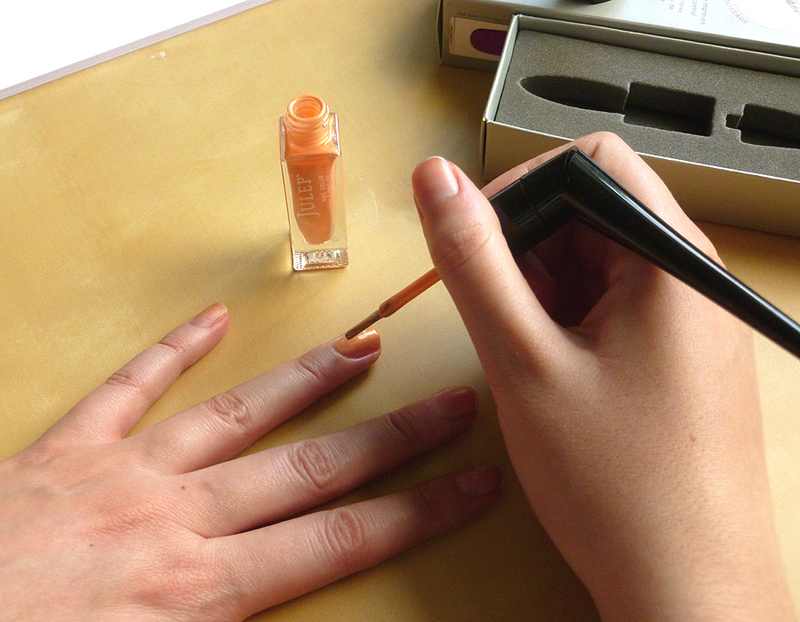 I received the Plié Wand the other week when my box arrived, and while I don't think it's completely necessary to painting your nails I can see how it could make the process a bit easier and more comfortable (especially for your Cinderella hand). I have some pictures and thoughts to share, and I also put together a quick tutorial to explain how to attach and use the wand with your normal polish caps. Let's jump right in! Details/Instructions: An ergonomic nail polishing tool designed to solve common polishing pain points and give you better results. 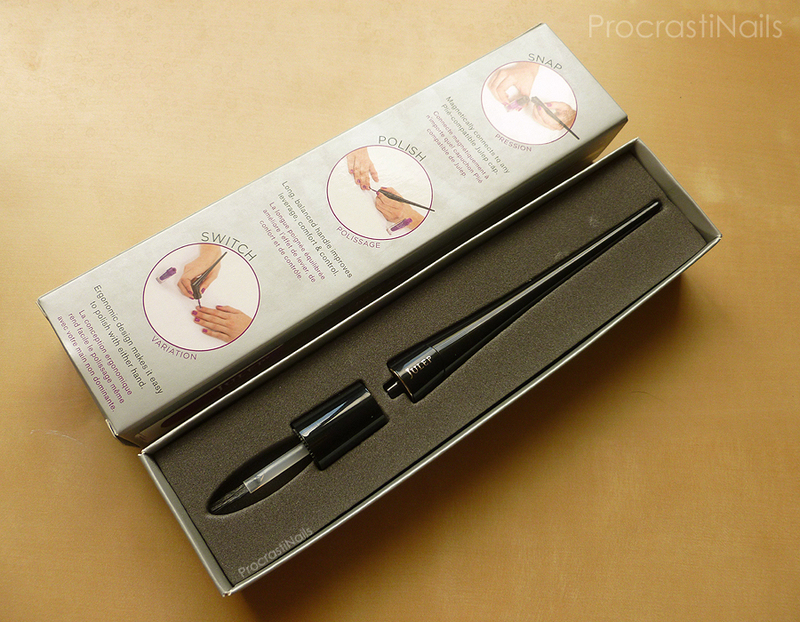 Imagine if you’d spent your whole life writing with a pen cap and then someone finally handed you a full-size pen. That’s what it feels like to polish with the Plié Wand. 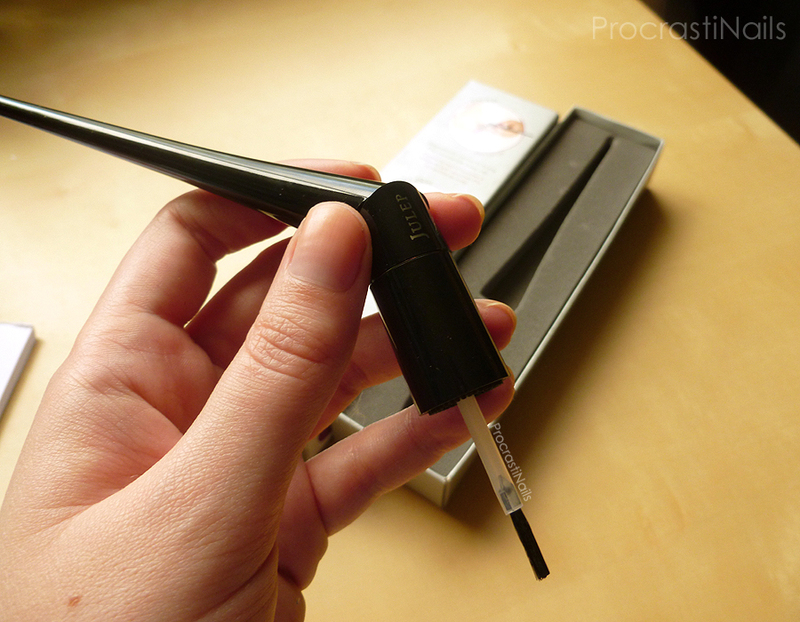 and the Precision Brush, which has a shorter stem for more control. I love the Precision Brush - the first time you use it you need to dip it in some polish remover to get the film off, but after that it's the softest thing in the world. The bristles seem to fan out across your nails more than the normal brush, and the stem of the Precision Brush is much shorter than the normal Julep brush. The Plié Overcap is a really great invention because it fits perfectly over the normal Julep brushes. I remember when Julep announced their idea for the Plié Wand there was a lot of concern about what was going to happen to our old caps/brushes. With this addition you can still keep your polishes stored with their normal caps (and swatching stickers) and then just pop it off and replace it with the Plié Overcap when you want to paint. The wand has been created in a way that lets the the majority of it manoeuvre in a full circle at any angle away from the base. This allows you to shift the handle into whatever position is most comfortable for your hand (yay ergonomics!). I really appreciate that you can actually manoeuvre the wand to sit at any degree - I was worried it was only going to have one or two fixed positions that it would snap into. That being said, there are two positions that the wand best locks in to: straight and a ~90° angle. But it holds at all the places in between those quite well, too. Another worry I had going into this was that the magnet to hold the Plié Wand and Plié Overcap wasn't going to be strong enough, but my worries were completely unfounded. 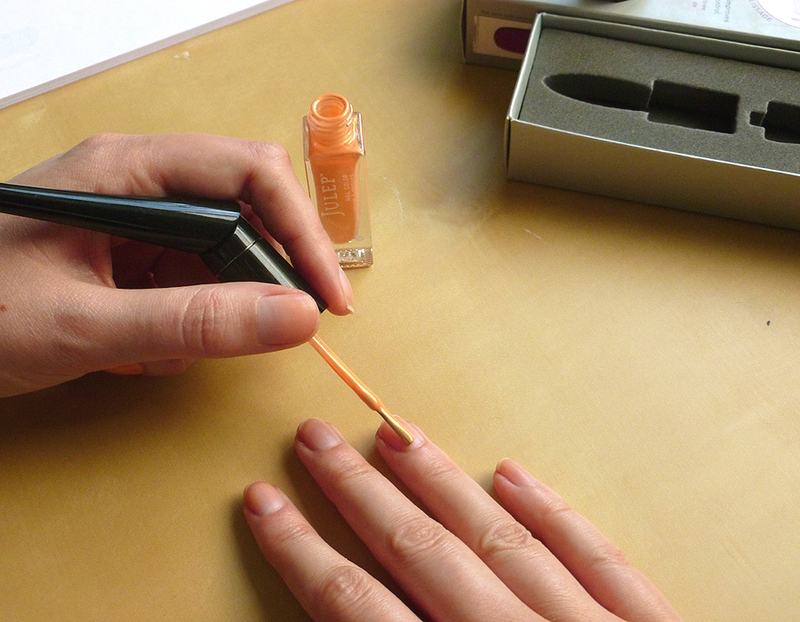 Re-adjust to the approprate angle for your other hand and finish off your nails! Overall I'm fairly pleased with how Julep's Plié Wand turned out. Will I take the time to dig it out and use it each time I'm painting my nails? Probably not. Do I think that a company as large as Julep needed to crowd fund the money for a product like this? Nope. But it's still a fun tool, and definitely a new item in the nail polish field. The Plié Wand system (wand, brush and overcap) is available on Julep.com for $25 ($20 Maven) with double packs of the Precision Wand/Plié Overcap combo available for $6 each. It's also available as an add-on with your June 2014 Maven box. Great review on this wand. It looks very interesting.